"Green shells? No, just a lot of nitro." Vivendi Games Mobile has just announced the launch of Crash Bandicoot Nitro Kart and Crash Bandicoot Nitro Kart 3D in Europe. 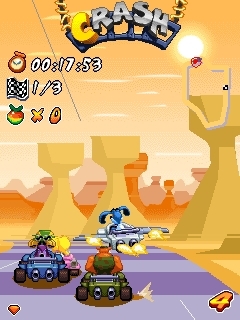 Appearing in both 2D (for Java phones) and 3D (for Symbian devices) formats, players have the opportunity to race on 16 tracks in eight different environments with ten power-ups and various bonus functions like kart jacking and the turbo plane. 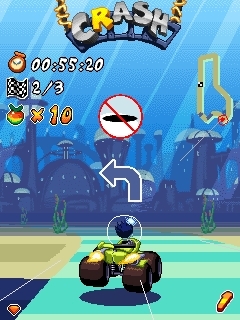 Not to be confused with the original Crash Nitro Kart, Crash Bandicoot Nitro Kart is an entirely new game. "When we decided to create a sequel to our highly successful 2004 mobile game of the same name, we knew we had to set the bar very high and come up with the best kart-racing game available on mobile phones today," said Paul Maglione, president of Vivendi Games Mobile. "We benchmarked all racing games on mobile phones -- not just kart-racing games -- and pushed the technology and graphics to the limit in both 2D and 3D and then added the craziness and attitude that make Crash Bandicoot games special. The result; a Crash Bandicoot Nitro Kart game that really packs a punch with all-new backgrounds, tracks, weapons and even different driving sensations." A Crash Bandicoot Grand Prix will also be taking off with key players from the mobile industry going head-to-head with everyday joes in the race for a host of different prizes.